The OS523E/24E-W Series has been discontinued. As a possible substitute, connect the Analog output, 1mV/Deg., of the IR Gun into a wireless system such as UWPC-2A. With their powerful features, the portable and rugged high-temperature OS523E/524E Series infrared thermometers offer solutions for many non-contact temperature measurement applications. 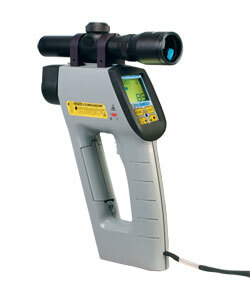 Their emissivity, adjustable in 0.01 increments, allows them to measure a variety of surfaces. A custom backlit LCD features dual digital display of the current and max, min, difference, or average temperatures simultaneously. Standard features include high and low audible and visual alarms, 1 mV/degree analog output, RS232 output, and temperature data storage. Wirelless Receiver - One receiver works with up to 48 Wireless instruments! Remote USB wireless receiver 915 MHz (USA/Canada). Use with -W9 IR Guns. 참고: * Add "-SC" for thermometer with sighting scope and add $100 to price. Large, hard carrying case OS520-SC-RCC and MINI-TRIPOD included. Add "-DM" for built-in distance measurement and add $75 to price. ** For 915 MHz (USA/Canada) insert “-W9”. For 868 MHz (CE models) insert “-W8”, no additional cost. Sighting scope is factory installed and aligned, not field installable! Accuracy ±1% rdg or 2°C (3.6°F), whichever is greater.